In August Gerardo had three days of training in Long Beach. So, the kids & I tagged along (I wasn't gonna let him go alone..right Noemi??lol). We had a lot of fun & did a lot of stuff. A lot of sightseeing, shopping and visiting family. We were less than an hour away from my family in Oxnard, so one day while Gerardo was in training, me and the kids went to Oxnard to visit. While we were there, we decided to give Aaron his first haircut, well, it was more of a trim than a full on big boy haircut. 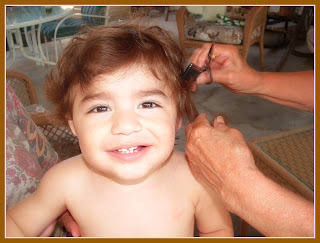 My Auntie Mary had the honor of cutting my baby boy's first little curlies off. She is Jacob's Nina & gave Jacob his first hair cut when he was 9 months old. So, I knew that I wanted her to do it and this was a perfect time. Aaron did a really great job, he didn't cry or get really fussy. He even smiled and laughed quite a bit during the haircut. When it was all said and done, it looked pretty cute and you could still tell that he had lots of curls. Gerardo was a little upset with me because he wasn't there, and I don't think he was quite ready for our baby to get his first haircut...even though he had been bugging me about it...ugh, men, they can never make up their minds. But in the end he liked it too. Click here to see all the pictures of Aaron's first Haircut and some pictures of a short trip to Oxnard Beach. These are some more pictures and short videos of the kids playing in the backyard. These pics and vids were taken almost two months ago, so Aaron was just learning how to walk. He was still super wobbly and fell down a lot. But now he's an expert and he even runs!! There is also a little video of my princess Lilly chasing Spike around the yard, so cute! Click here to see all the pictures and videos!! !